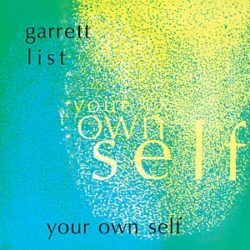 Black Sweat presents a reissue of Garrett List’s Your Own Self, originally issued in 1972. Produced on Max Schubel’s Opus One label, it was a remarkable creative effort, conceived like a celebration of a higher self-consciousness. The context is avant-garde minimalism, but the music is enriched by a deep spiritualism; it echoes the most meditative jazz of the age, taking also advantage from the mystic lesson of La Monte Young. Everything is solved in a free, moderate and brilliant language, pure and elegant. It’s quintessential, in these rare moments of beauty, the instrumentation of the voices and the relative interpretation of the text. The sibilant female chant is lost in an intimate and ethereal recitation, wrapped by the drones of the horns and the dripping notes of the piano and vibraphone. It’s the ideal atmosphere for an impalpable ecstatic way, the echo of a secret dialog with the inner cosmos. On this recording, List seems to condense perfectly all his emotional and transcendental sound universe, making Your Own Self not only a seminal work, but also a radiant message of total harmony.